Everyone knows how the First Act went: With the bloodiest war in the country’s history winding up in his win column, the President, his wife, Major Henry Rathbone, and his fiancé, Clara Harris, took their box seats at Ford’s Theater for a performance of what passed for a blockbuster in 1865, the cornpone hit, My American Cousin. 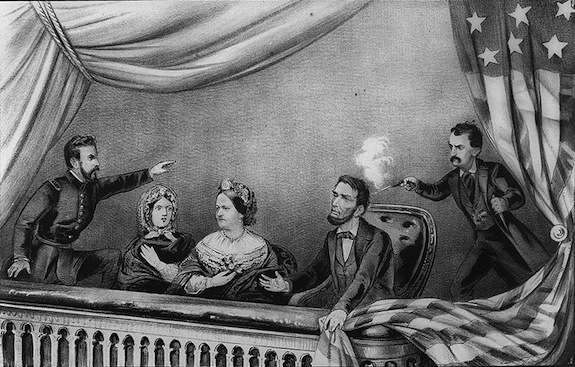 With Lincoln’s bodyguard late arriving back from a trip to a neighborhood pub with members of Lincoln’s valet staff, one of America’s most popular actors and a despondent Confederate sympathizer, slipped into the box and fired a fatal shot to the back of the President’s head. He stabbed Rathbone and leapt to the stage, breaking his leg, but ever the thespian, raised his knife and shouted to the baffled crowd, “Sic semper tyrannis!” and disappeared into the Washington DC and Maryland night. After a few decades as a church and lost to fire in 1862, John Ford rebuilt the theater and opened it to great fanfare in 1863. The lavish venue was the place to be seen in wartime Washington society. The crowd at Ford’s Theater that evening of April 14, 1865 was there to hopefully see the nation’s newest, hottest hero, General Ulysses S. Grant, who had that week accepted the surrender of General Robert E. Lee at the Appamattox Court House just five days earlier. Grant and his wife were expected to accompany the President and Mrs. Lincoln to Ford’s, but had already left town. Speaker of the House Schuyler Colfax was also reportedly invited but declined. The Lincolns were finally joined by Ms. Harris and Major Rathbone, and all took their seats in history. John Ford was confined in the Old Capitol prison for 39 days while authorities investigated any complicitiy in the plot (there was none determined). On the day that Booth’s conspirators were hanged until dead, Ford gamely tried to re-open his gorgeous but tarnished theater, but he demurred at the violent outcry from the public. An appalled and grief-stricken Edwin Stanton, Lincoln’s Secretary of War, vowed that the theater should never exist again as a house of gaiety and entertainment, and seized the building for the government. He wanted all evidence of this house of death and human tragedy erased from memory. All trappings of Ford’s as a place of merriment were scoured from the building, moving his War Department’s Record and Pension Bureau in. From that day forward it would be a theater of the mundane. As every memorable act has a curtain call. 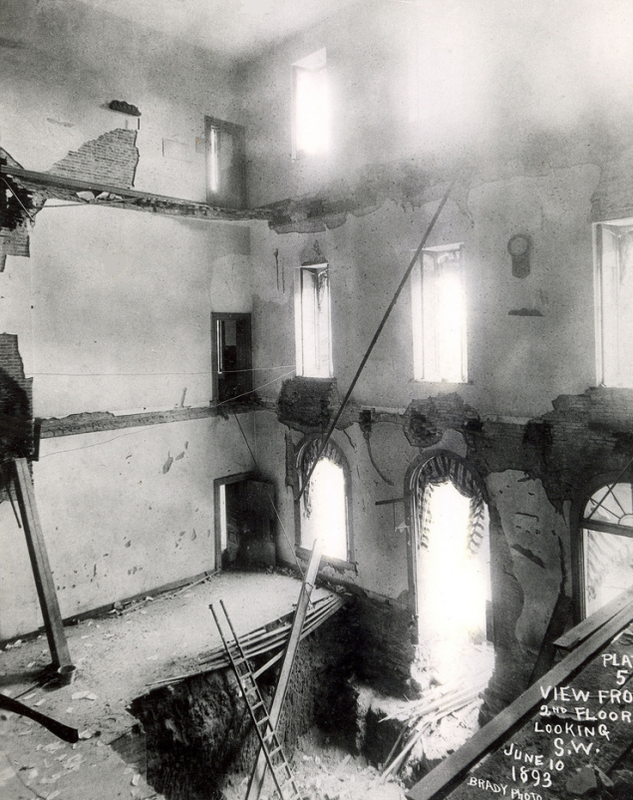 so did tragedy come out for an encore at the erstwhile Ford’s on June 9, 1893, when an upper story bursting with pension documents and office equipment gave way, killing 22 persons and injuring 68.